Black Bear Events can bring its years of expertise in event planning to your special day. We can provide a full event planning and booking service, or simply the hire of equipment and advice for your celebration. We specialise in outdoor events, recently more people are moving away from formal indoor celebrations and finding that a more relaxed outdoor event is a more memorable, greener and cheaper option. Our areas of expertise include the planning and setup of your venue – tents, marquees, barns etc, provision of power, lighting, furniture, décor and catering. We can also advise on areas that can lessen your environmental impact, such as transport and sourcing local, seasonal foods. 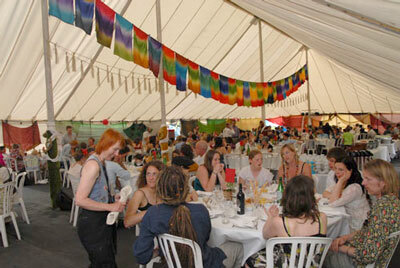 We can offer advice and contacts for a range of excellent caterers, musicians and celebrants for your special day. 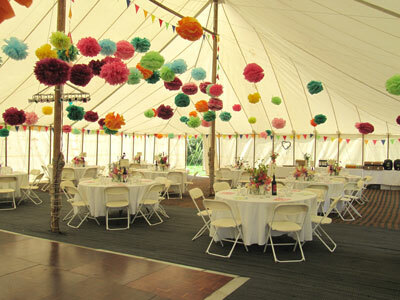 "Our wedding was held in a field so we had to bring in everything from marquees to teaspoons. As soon as Black Bear Events agreed to manage things for us I relaxed. They looked after the big things and the small things throughout. We had a fabulous wedding day and by 5pm two days later the site looked immaculate and everyone was still smiling." 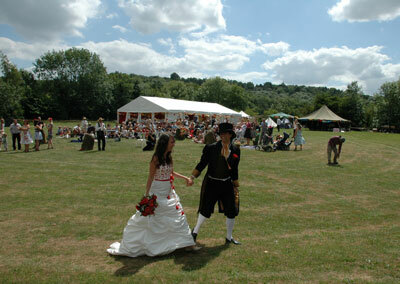 "Black Bear Events were a huge help with our alternative eco-wedding. They provided exactly the right equipment and materials for our needs, and having their reliable, experienced and knowledgeable staff on hand allowed us to run the event in just the way we wanted. We'd recommend them to anyone!"